Are you spending 8+ hours a day hating your job, your coworkers, your boss, or maybe even all three? When you are thinking about enhancing your positivity, doing so in the workplace should be on the top of your list. It is where most of us spend a massive amount of time, so if you hate it, you may have noticed that those negative feelings often spill over into your personal life as well. To feel a sense of balance, it is important to feel fulfilled in all areas of your life, and your workplace is no exception. One of the workshops that I offer at Contagiously Positive is called, Enhance Your Positivity In The Workplace. I love facilitating this workshop because I have learned so many lessons throughout my own career that has made me love working with a team. If you have been following me on social media, you know that I love to teach what I learn, which is why I wanted to share with you some of the things I teach in this full-day workshop. If you don’t plan on leaving your job, and if you want to learn how to be happier at your current or future workplace, this post is for you. 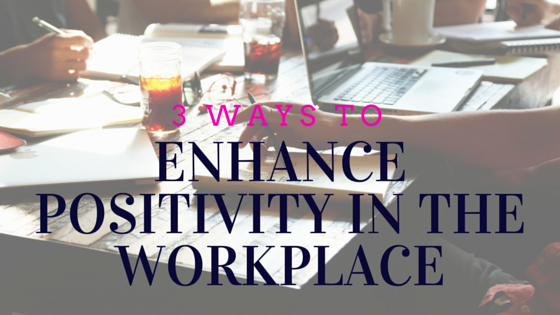 Here are three things you can do to enhance not just your positivity in the workplace, but your coworkers as well. Gossip spreads like wildfire through a workplace and creates a toxic environment. There is no benefit to gossip. All it does is make you and the person you are gossiping about feel really small. Have you ever felt good about saying nasty things about someone? I know that I haven’t. I use to give in and participate in office gossip and I always felt so bad afterwards. I actually got caught gossiping once and I felt like such a terrible person. Not to mention how I made the other person feel. After that moment, I knew I had to change because I never wanted to inflict that kind of hurt on anyone again. Why does gossip make you hate your workplace? The more negativity you spread about someone else, and the more you talk about it, the worse you are going to feel. You are fuelling yourself with hateful and negative comments, and thoughts that make it very hard to enjoy being at work. And, not just for you, but those around you. Negativity is just as contagious, if not more so, than positivity. Another reason is because deep down you know this to be true, whoever gossips to you will gossip about you. This develops a lack of trust amongst the team and can make you insecure – another negative emotion that can make going to work discouraging. Here is what you can do. When trying to avoid office gossip, the best advice I can give you is to walk away when you hear your coworkers gossiping about someone else. Eventually they will stop unloading negativity on you and you will start to feel more positive about the people you work with. Resist the urge to participate and take the path of least resistance. Do not allow yourself to get sucked in to the gossip vortex. Ask yourself this question, before you spread gossip. How would it make you feel if someone said this about you? How would it make you feel if that person found out and confronted you? I read about protecting your turf in John C. Maxwell’s book, The 360 Leader. It made so much sense to me and really changed the way I work in a team and even the way I view competition. Protecting your turf means keeping everything to yourself – your ideas, your projects, your office space, your supplies, your content, your projects, basically everything you feel you could lose to someone else. John C. Maxwell says that protecting your turf is often about power. The “turf-protector” protects whatever is theirs because they don’t want to lose power. Meaning, if they lose power, they might not win. People who protect their turf feel that if someone has what they have, or what they want, they won’t get it. They feel that there is not enough to go around. They will fight to keep everything that they believe belongs to them. If it “belongs” to them, they protect it. You don’t have to protect your turf. Trust me, there is enough to go around for everyone. If you feel that you are a “turf-protector” I want you to remind yourself that just because one person has it, doesn’t mean you can’t. Also, in the workplace, it is about the team, the company, and the client. The moment you try to keep everything to yourself, all of those suffer, including yourself. The most successful people are those who work well with others and those who support, and respect their competitor’s successes. I have many competitors out there, and I love that because it means that I am not the only one holding space for wanting to make a difference in peoples lives. I can’t reach billions of people, and not everyone will resonate with my message. So, the more of us who are doing it, the more positive changes we can make in people’s lives and in the world. Ask yourself, what could you consider your turf and have you been protecting it out of fear of losing it? Respect in the workshop creates such great team harmony. If you want to enhance your positivity at work, you need be respectful – even with people who don’t initially put any effort into being a respectful back. I believe strongly that you get what you give. If you lead the way, and are respectful, people will eventually show you the same respect. A great way to learn to respect each other is to find some non-work related things in common. It could be sports, fashion, children, hobbies, or pets. Just try to find some common ground. Often what happens, is when you don’t have the same work style, it can cause friction and make you not respect each other. However, if you can see someone as a whole person, and not just their job, that is where the respect will start. From our age, gender, culture, values, personalities, education, work ethic, we are all different and those differences are what make a great team. If you can embrace it, respect it, and spread it, you will enhance your positivity in the workplace.